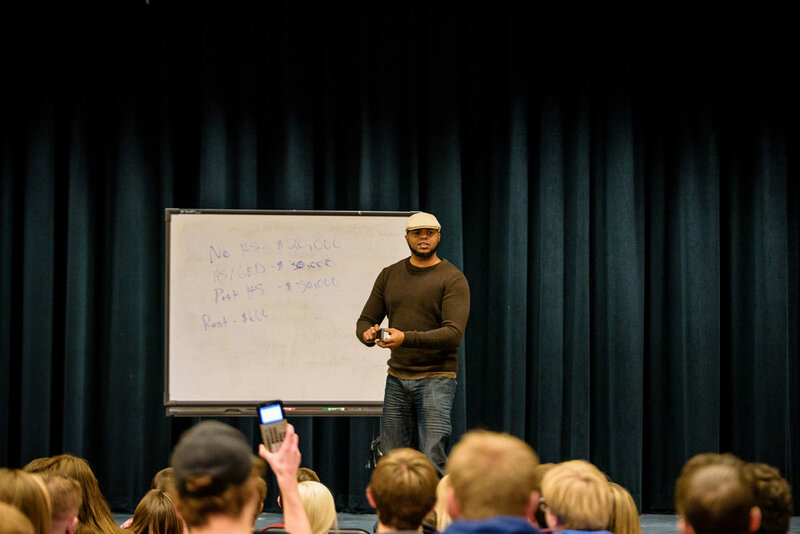 Devine Carama Speaks to Over 2,000 Students in Portland, OR On Hip Hop & Leadership! 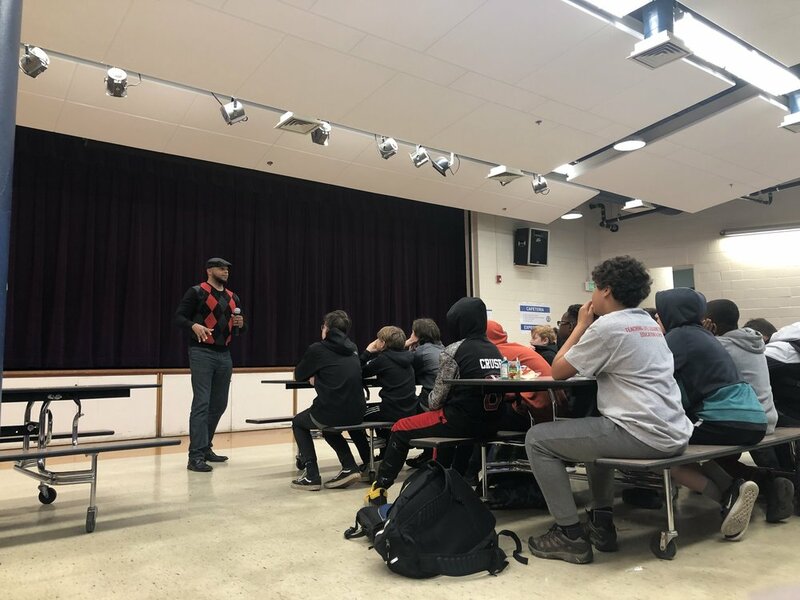 Our director, Devine Carama, had the opportunity to speak to over 2,ooo students in Portland, Oregon last week as apart of his “Leadership & Legacy” tour. 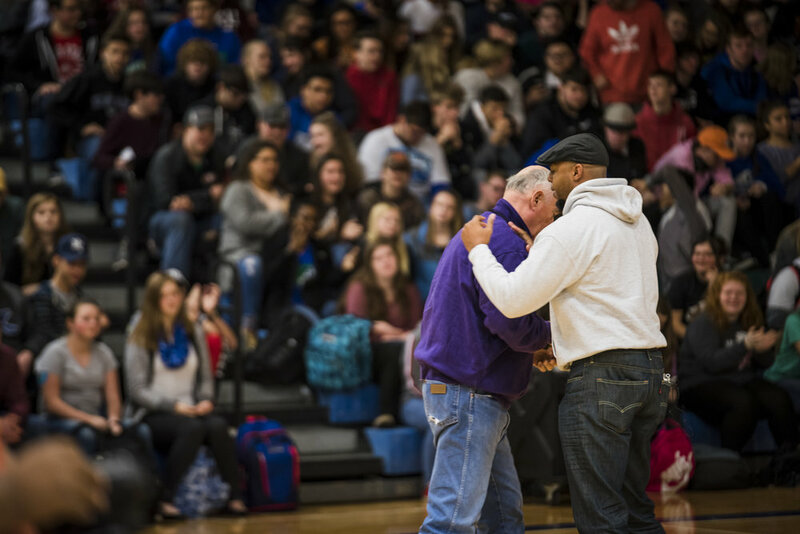 He visited Harriet Tubman Middle School, Jackson Middle School, Creston School K8, and Astor Elementary School. Check out Devine’s very own thoughts on his trip BELOW!! 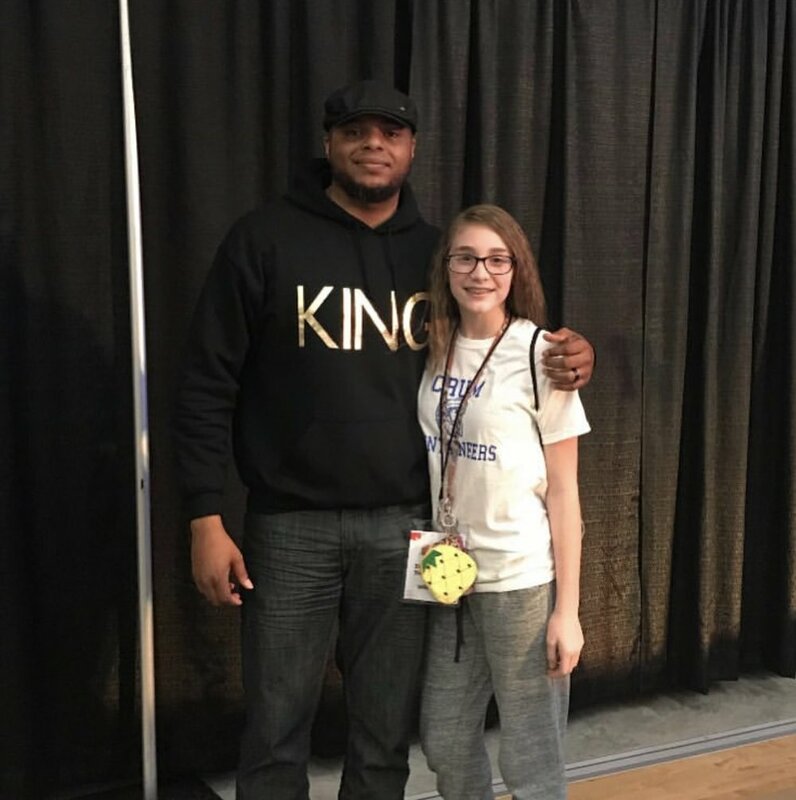 Devine Carama Talks Leadership & Anti-Bullying to Over 3,500 Students in North Carolina! Words from our director, Devine Carama, on his recent trip to present to student in North Carolina. 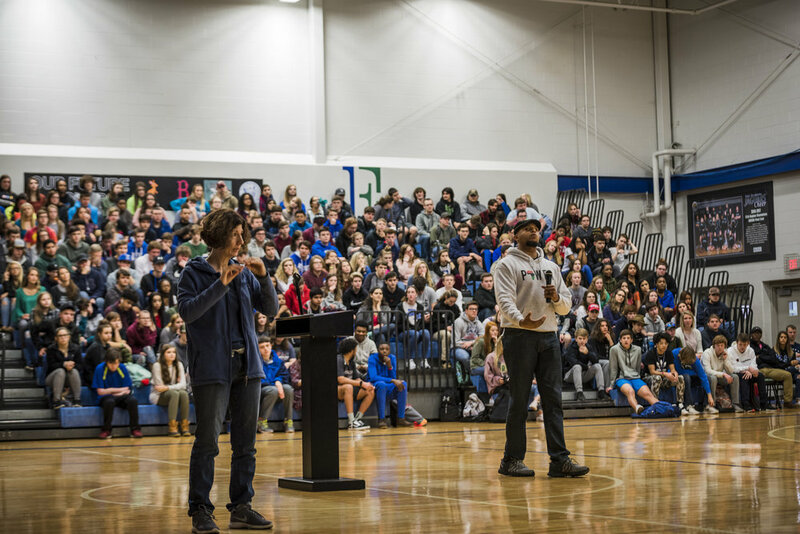 Devine Carama Talks "Leadership & Legacy" to Over 1,000 East Jessamine Students! 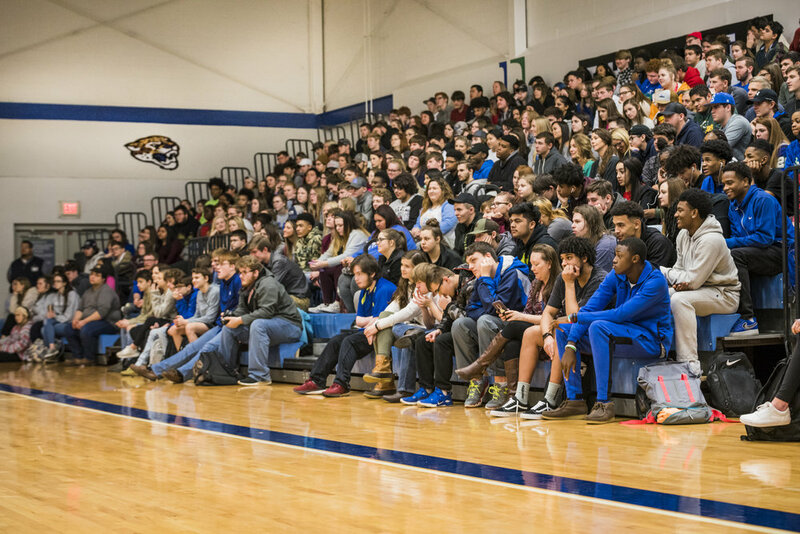 Hip Hop Artist, Devine Carama, Talks to Franklin Co. High About "Leadership & Legacy"! 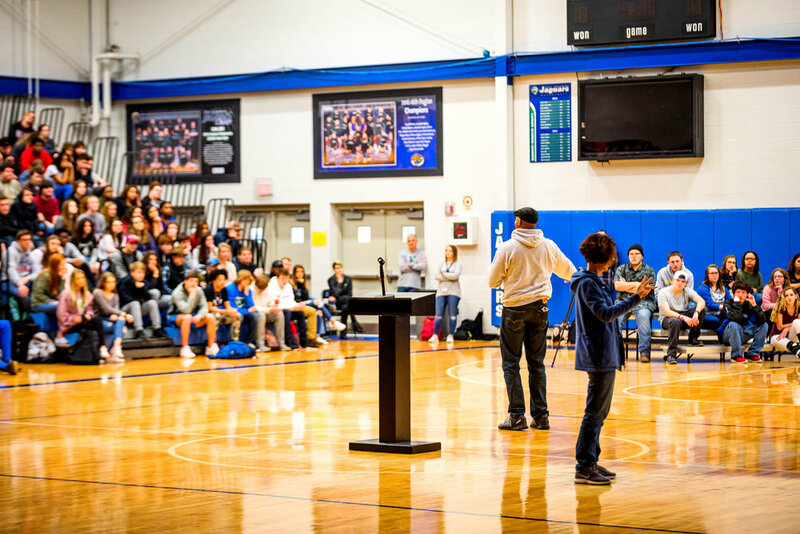 Devine Carama Speaks to 1,200 Students at Woodford Co. High School's Unity Day! 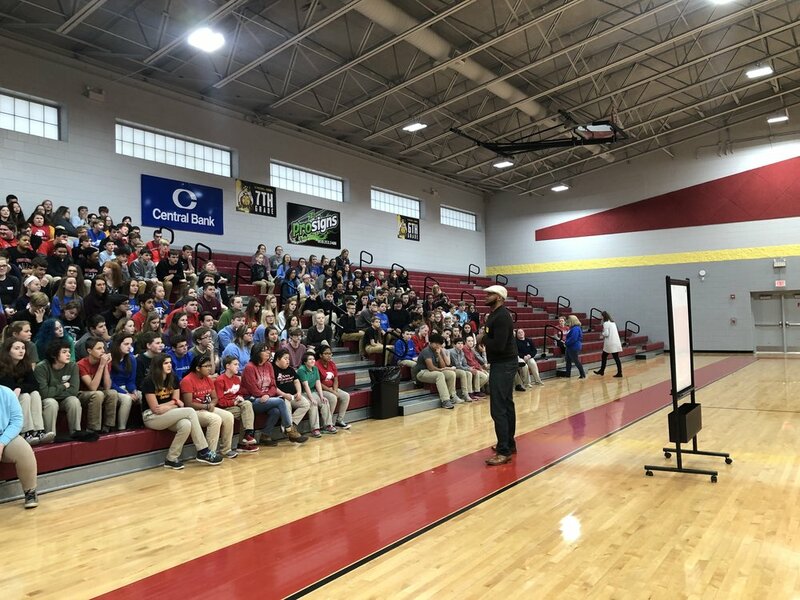 This past week our founder, Devine Carama, had the opportunity to speak to over 1200 students at Bourbon County Middle & High School. 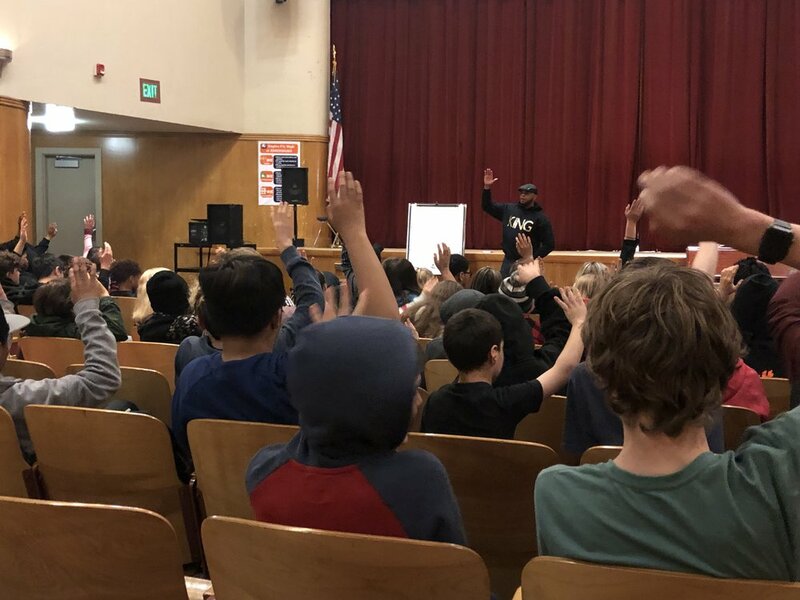 He spoke to each grade level separately about an array of topics including bullying, youth leadership, leaving behind a legacy, the impact education has on their future and more! The Kentucky hip hop artist is schedule to travel and speak to students in North Carolina, Seattle, WA, Chicago, IL, Portland, Oregon, over the next couple of months. 5 Lexington Youth Win Laptops In Leadership Contest! Believing In Forever Giving Away 20 Laptops Through Service & Essay Contest! Help "Sons of Single Mothers" Receive a $25,000 Grant! Vote NOW! Lexington indie MC & community activist and our founder, Devine Carama, (has opened up and worked with acts like Talib Kweli, Big KRIT, Cunningynguist, Nappy Roots, Little Brother, Canibus, Nemo Achida, Allen Poe and more!) along side associate professor Bryan Hains, were given the opportunity to teach a hip hop & community development class at the University of Kentucky this year called "Lyricism & Leadership: Hip Hop & Community Change". The 4-week summer elective course ended with a final exam of the class completing an 8 song EP entitled, Agents of Change Volume 1, featuring themes of challenges that economically impoverished communities face. Now that the project is completed, they are to market the project and give the proceeds to a local nonprofit. The class chose "On The Move Art Studio", a traveling art studio that cities inner city communities with FREE art workshops, as the nonprofit to donate to. Agents of Change Volume 1 Available Now!! "The 6 students engaging this final exam had never professionally recorded or put out any music before and all of them come from complete different racial ,generational, and economic backgrounds. The purpose of the class was to highlight the evolution of "leadership" and community development. Leadership is no longer preserved for rich, powerful white business men in suits. Leadership can be exhibited by anyone taking a stand or using their voices through whatever talents, gifts, and opportunities they have. Whether a blogger, artist, or a bus driver, everyone has the capacity to lead in alternative ways. I myself don't have a college degree, so being a hip hop artist and given the opportunity to teach a college class in itself is an example of how "leadership" and community development has changed." Sons of Single Mothers Mentoring Group, Leads Father's Day March! Our founder, Devine Carama, speaks about our #SonsOfSingleMothers Mentoring program and the significance of having positive male mentors in the community! Lexington Students Get "A's" on Report Cards & Earn 457 FREE Haircuts! This is good news from some Lexington YOUTH! PLEASE SHARE!! Good morning everyone! The Believing In Forever Inc.’s #GradeACut initiative final numbers are in! This is a program we started where a select number of boys from a school had the opportunity to earn FREE haircut vouchers for every “A” he received on his final report card of 2017. Below are the final number of vouchers earned from each school and the barbers that are helping out with this initiative! For a grand total of 457 FREE haircuts! Big thanks to Anthony Burdette of Platinum Barbershop, Robert George aka “Future” of Final Cuts barbershop, RJ Cobb of Cultural Cuts Barbershop, Jonathan Bronaugh at Idle Hour Barbershop, Fades Barbershop, Choice Barbershop, A DJ Cut Barbershop, & The Illustrated Barbershop for donating some of your services! Devine Carama Covers the Chevy Chaser!! Our directer, Devine Carama, made the cover of one of Lexington, KY's favorite publications, the Chevy Chaser! Check out there cover story below! Community Action Head Start Enrollment Day!